On 17 March 2009, Madagascar's President Marc Ravalomanana resigned, following weeks of popular protest and division within the military that had dangerously divided the country. Ravalomanana handed control to the military who in turn handed it to Andry Rajoelina, the leader of the protests. Rajoelina was a newcomer to politics, having just been elected mayor of Antananarivo in December 2008, and never having held office at the national level. Rajoelina formed a transitional government (Haute Autorité de la Transition, or High Transitional Authority) but he has had trouble winning international recognition as Madagascar's leader, and political divisions within the country have persisted. In the meantime, conservation of Madagascar's forests has suffered for three reasons. First, the lack of international recognition has caused many donor countries to suspend aid to Madagascar. Thus, the Ministry of Environment, Forests and Tourism lacks the budget it needs to effectively protect forests throughout Madagascar. This aid vacuum also has reverberating effects which increase poverty in the population at large. 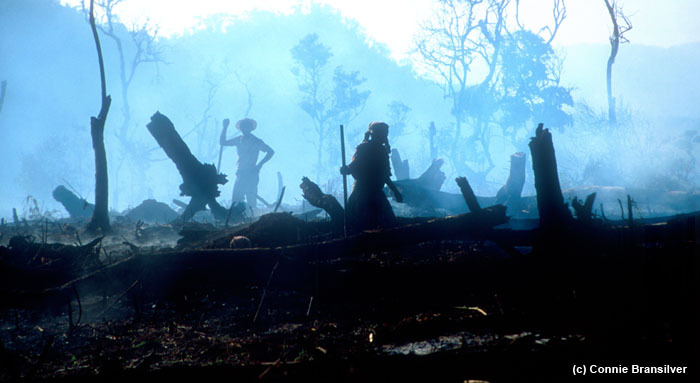 Second, some elements of local populations take advantage of the government's distraction to pursue illegal forest clearing, and illegal logging (such as the rosewood logging within Marojejy National Park). Third, the tourism industry has crashed due to security concerns, and the benefits of ecotourism for local communities have vanished, at least for now, causing some to look for alternate sources of income. Conservation groups have taken notice: on 27 March 2009, eleven leading conservation groups in Madagascar published a warning about the effects of the political crisis on biodiversity conservation: "The Trees Must Not Hide the Forest: the Loss of Malagasy Heritage". This warning was repeated in the Malagasy media in late May (a joint statement by several conservation and development NGOs and embassies), but to little avail. At Tsinjoarivo, several illegal forest clearings have already begun in some of the more remote areas, and reports of illegal logging and forest clearing throughout the country are increasing. Whatever the outcome of the political crisis, and whoever is recognized as Madagascar's leader, it is becoming clear that as the political uncertainty drags on, so increases the irreversible damage being done to Madagascar's unique biodiversity. Action is urgently needed to reverse these growing trends.